Salmon Steaks, a fun twist on the classic salmon fillet. You can season these with just about anything you want, and since this a rich, hearty fish you can season it pretty aggressively. As we did in “Taking my Teriyaki Back to you Babe,” you will cook the fish the same way to achieve salmon salvation. Oh, did I mention teriyaki? Yes, you can brush a little teriyaki sauce or marinade on both sides of the steak. Remember to taste before you apply so you can adjust if necessary. How do I wake this plate up? Well, I think I will let this photo answer that question for you. Boom! 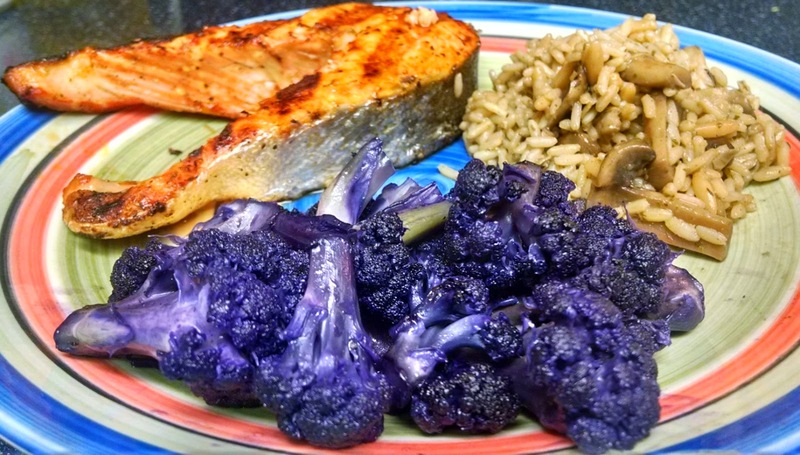 Yes, that is purple cauliflower and it really makes the dish stand out. As far as how to apply heat to the salmon, you can either go with the grill or the oven. Again, the grill is going to be my first option since it makes the fish look really pretty and the grill marks actually aide in building the flavor. For example, the grill marks can give you a little caramelization and char that will help bring the flavor of the fish together. In order to achieve perfect salmon, cook these about 3-4 minutes a side at 500 degrees if your steak is about one inch thick. I prefer to cook at a slightly lower temperature, around 450 degrees, which I will say takes about 12 minutes total. You want the fish to be pink and moist in the middle, so factor in carry-over heat as you cook these steaks.